The French Impressionists popularized the practice of painting “en plein air” — in the open air — in the mid-nineteenth century. These artists, considered radicals in their time, were intrigued by the momentary, transient effects of sunlight on objects, and on the changing qualities of light as the day progressed from morning to afternoon. They abandoned their studios and set up easels on river banks and meadows, on beaches and in wooded glens — and in the process, changed art forever. 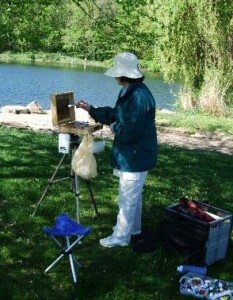 A local group of artists called the Plein Air Painters of the Western Reserve have adopted this time-honored tradition. They show up every Wednesday morning at nine A.M., May through October, at a designated Medina County park and paint industriously until noon. 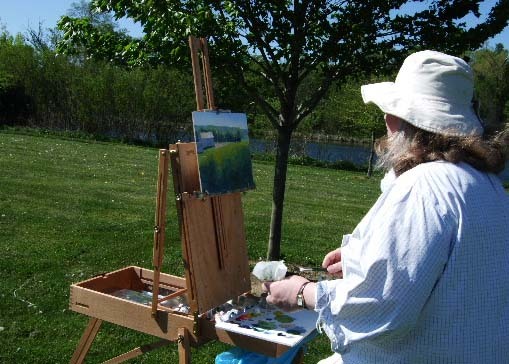 On this hot, sunny morning in May, the Plein Air Painters, swathed in wide-brimmed hats and long-sleeved shirts have gathered at River Styx Park in rural Medina County and set up easels in shady, secluded areas. 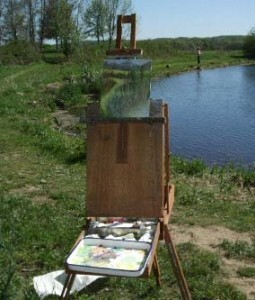 They are working in a variety of mediums — oil, watercolor, acrylic and pencils. She gestures toward the oil painting of a barn on her canvas. “The shadow on this roof has been getting shorter and shorter as the morning progresses,” she observes. 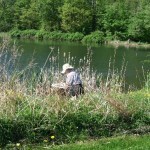 Dave Fawcett , another award -winning artist (he won first place in the Aquarius Art show sponsored by the Medina County Art League this past February) hides in the deep shade and works on a view of the lake. He retired from banking ten years ago and has, since then, devoted himself to art. 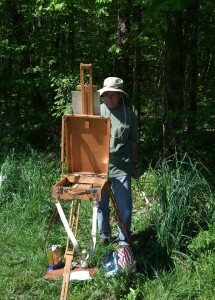 He works so quickly that he has completed one painting by 10:30 and is contemplating a second one. The first painting is so realistically rendered that the canvas seems to blend in with the actual scenery. Now he is faced with a decision. “I’m thinking of doing something more abstract with the second painting, he says. ” He explains that his work is moving more and more into the abstract realm. She has since moved on to acrylics and oil. Cindy Allman’s paintings are available at Gramercy Gallery, 221 South Court St., Medina. Dave Fawcett and Lee Beuther’s work is available at Art 101 Gallery, 23 Public Square, Suite 11, Medina. No Charge. New artists welcome. I loved reading about you and plan to join you whenever I can. Right now I’m pretty busy helping my husband recover from hip replacement surgery – he’s doing very well so I’ll be painting again soon. Thanks for the blog and for the welcome. I miss painting with all of you. I’ll join you (weather permitting) once my Wednesday class is on a break in June. Thanks for some other informative site. Where else may just I am getting that type of info written in such an ideal means? I’ve a challenge that I’m just now operating on, and I’ve been on the look out for such info. 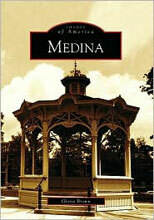 Link to a video of old Medina. I live in Ashland and we visit medina often. It’s amazing in favor of me to have a site, which is useful designed for my knowledge.